Among the most interesting stories of India are stories of the few offbeat temples which are known for unusual offerings to the presiding deities. The unusual offerings to some of these Indian temples are age-old traditions, while devotees make offbeat offerings to some temples out of their unconventional beliefs. We at Travel Beats, an Indian Diaspora community portal by Indian Eagle Travel offer you a walk through some of these temples to leave you with a gaping mouth in wonder. If you happen to visit the Chemmoth Sree Subramaniya Swami Temple in Kerala, make sure to offer Munch chocolates to the deity Munch Murugan. How the deity, the son of Lord Shiva, came to be known as Munch Murugan is one of the interesting stories of India. 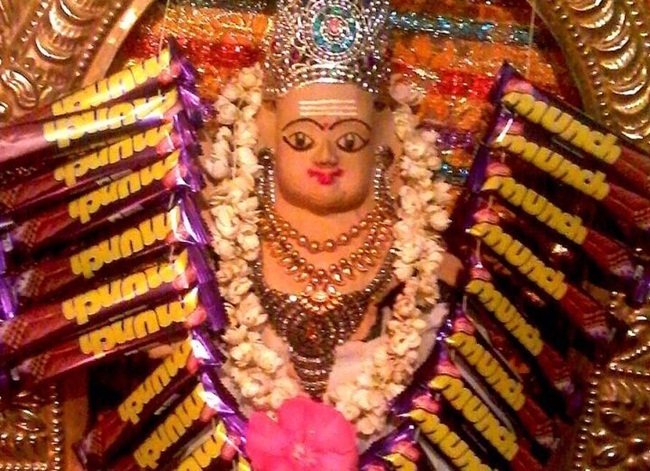 The deity developed a sweet tooth for chocolates since a Muslim boy offered a Munch to him. One day the boy rang the temple bell for fun and got scolded for doing so. He fell sick that night and kept chanting Murugan’s name unconsciously. The next morning, his parents took him to the temple. When the boy felt better, the priest asked him to offer something to the deity as it is a tradition. The boy took a Munch out of his pocket and put it on the altar. Since then Munch Murugan has been receiving loads of Munch chocolates from children who visit the temple to pray for good marks in examinations. Do you ever expect to get CDs, DVDs or textbooks as holy prasad in exchange of your offerings at some temple? 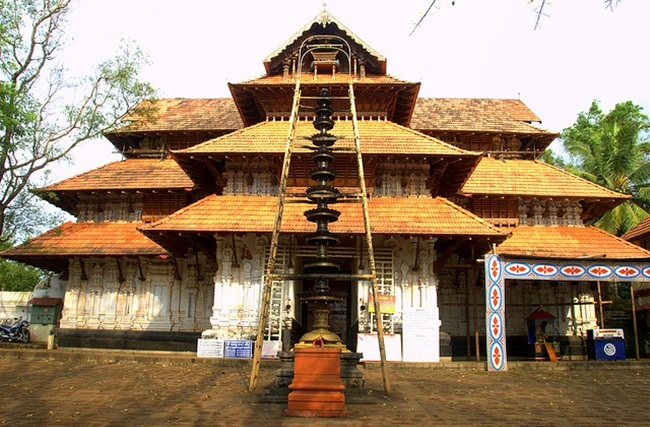 If yes, travel to India and visit the Lord Shiva Temple at the National Heritage Center in Thrissur, Kerala. The temple authorities believe that knowledge is the best gift of God and that devotees should be blessed with it. That is why knowledge dissemination through distribution of books and writing materials is considered the holiest prasad to visitors at this temple in Kerala. Alagar Temple in Madurai is one of the unique places to visit in India for unusual offering to the deity. Originally named Kallazhagar Temple, it is a temple of Lord Vishnu. At this Madurai temple, the deity is offered different types of dosas (a South Indian delicacy) which are later distributed as prasad among devotees. Devotees on visit to the temple bring grains which are used to make crispy dosas. The first dosa is offered to Lord Vishnu and the rest is distributed to visitors after prayers. 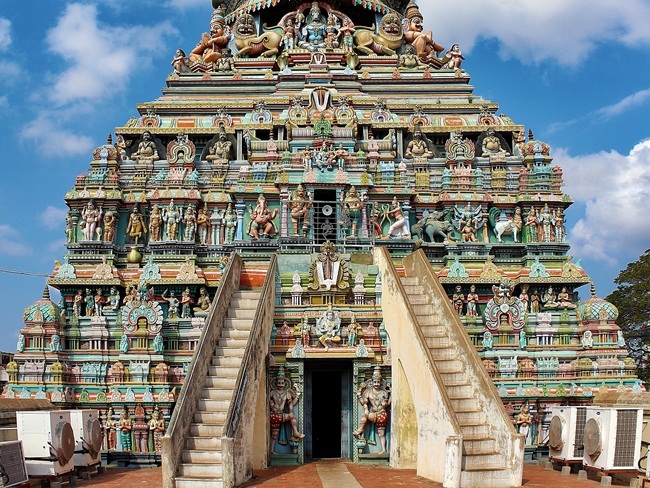 What devotes are given at Lord Murugan Temple in Tamil Nadu is among the interesting facts about Incredible India. 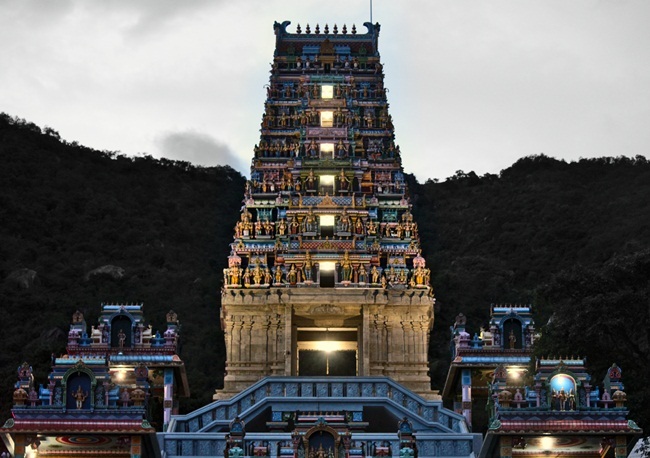 Located in the Palani Hills, the temple is known for offering a unique prasad to devotees. The prasad is no traditional sweet but jam made of jaggery, sugar candy and five fruits. The holy jam is known as Panchamritham. The temple has got a plant where the jam is manufactured. The Khabees Baba Temple at 80 km distance from Lucknow in the Indian state of Uttar Pradesh is one of the most offbeat places to visit in India. Surprisingly, there is neither any idol nor any priest at this temple, except a pair of two slipper-shaped structures on an elevated platform that seems to be an altar. Visitors offer liquor to the altar at the Khabees Baba Temple in Lucknow out of devotion to a mystic saint who is believed to have lived there 150 years back. Devotees receive a portion of the liquor offered here. If the offering of alcohol and chocolates to deities (mentioned above) does not surprise you, visit Brahma Baba’s Temple in Uttar Pradesh and see what devotees offer to please the deity there. 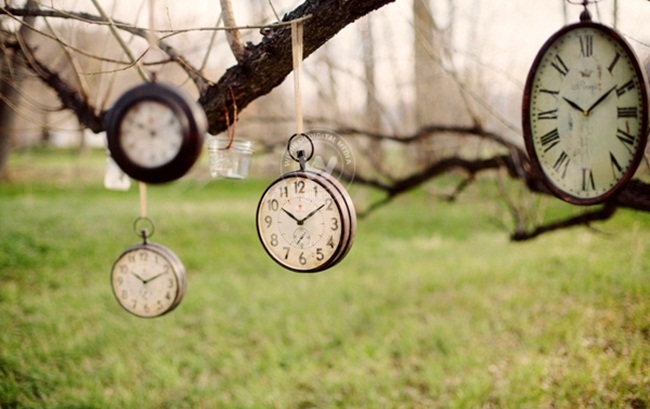 Devotees of all religions – Hinduism, Islam and Christianity – offer clocks and watches as tokens of gratitude towards the deity for fulfilling their wishes. Among the most interesting stories of India, the story of Brahma Baba Temple dates back to the time when a man asked the deity to bless him with driving skills. When he began to drive, he offered a clock as a thanksgiving gift to the temple. Since then it has been a tradition at Brahma Baba Temple. Surprisingly, there is neither security nor any priest to take care of the temple. A visit to the Chinese Kali Temple in Chinatown is the most interesting things to do in Kolkata. 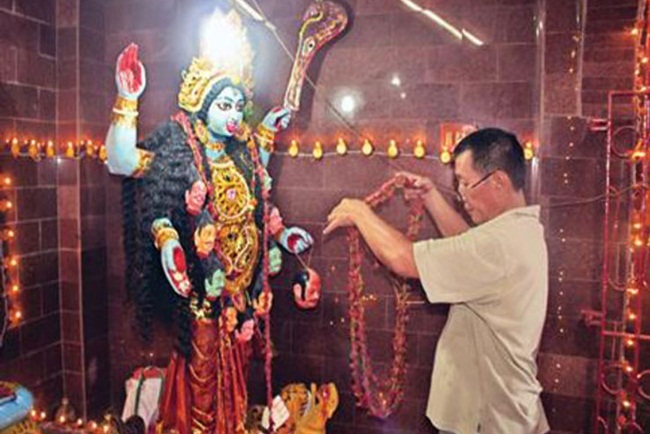 The temple is named so since the Chinese residents of Chinatown worship Goddess Kali. They offer different Chinese dishes like noodles, dim sum and chopsuey, not traditional Indian sweets to the deity. The worshipping of Goddess Kali by the Chinese inhabitants of Chinatown in Kolkata is also an instance of religious tolerance in India. Why Shaheed Baba Nihal Singh Gurudwara in Jalandhar is called Airplane Gurudwara or Hawai Jahaj Gurudwara is one of the interesting stories of India. 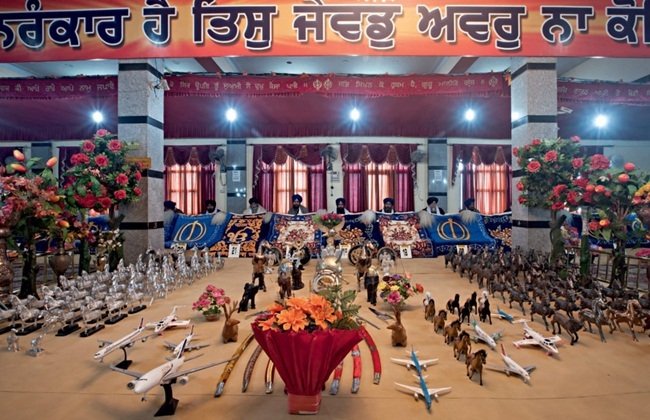 Devotees offer toy airplanes as prasad to this offbeat temple in Punjab as they believe that this unconventional offering will result in visa approval for them and fulfill their dreams of going abroad. And that’s why many shops outside the temple sell toy aircrafts. Karni Mata Temple in Bikaner, Rajasthan, is one of the most offbeat places to visit in India. It is a temple of about 20,000 black rats which are kabbas and considered holy. 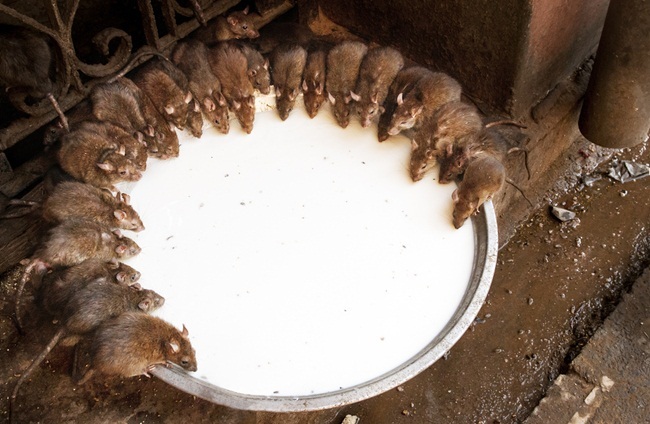 The prasad brought by devotees for the deity is also offered to the rats. Then devotees receive the prasad laced with rat saliva, which is believed to bring good luck to them. Kamakhya Devi Temple in Assam is one of the most offbeat destinations in India. What is offered to devotees in return of their visit to the temple during the famous Ambubachi Festival in June is one of the most unconventional and interesting stories of India. The Kamakhya Temple in Guwahati remains closed for the first three days of the festival and opens its door on the fourth day when small pieces of cloth moist with the supposedly menstrual fluid of the goddess are distributed as prasad to thousands of devotees who gather at the temple complex on this occasion. 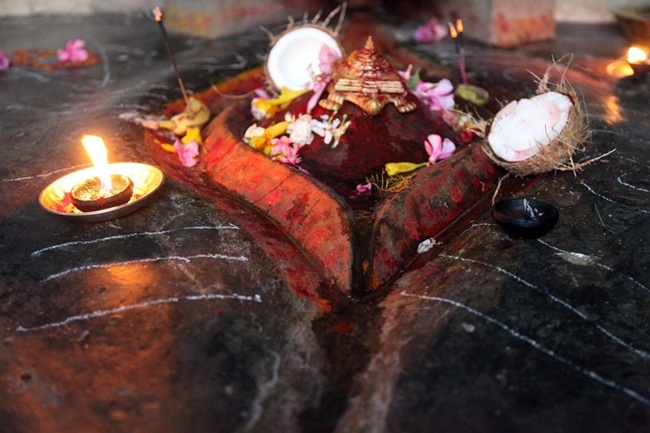 Kal Bhairav Nath Temple of Ujjain is one of the most popular Shiva shrines in India. 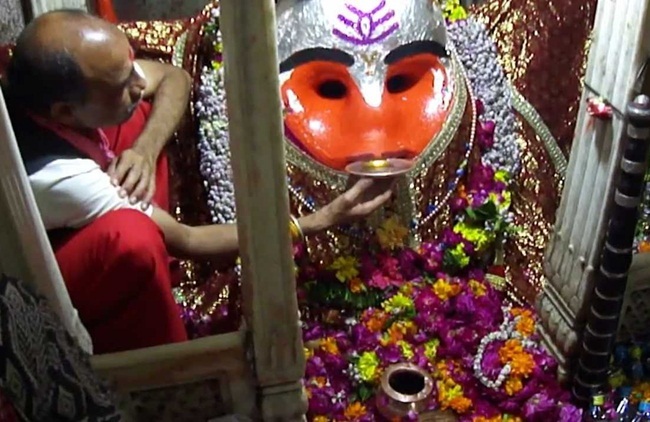 The guardian deity of Ujjain City in Madhya Pradesh, Kal Bhairav Nath is offered bottles of wine every day. Evidently wine is the only holy prasad given to devotees at Kal Bhairav Nath Temple. Different brands of wine are available outside the temple throughout the year. The temple was built during the Maratha regime, according to some Maratha legends. Panakala Narasimha Swamy Temple in Andhra Pradesh is one of the few Indian temples which are known for unusual offerings to deities. 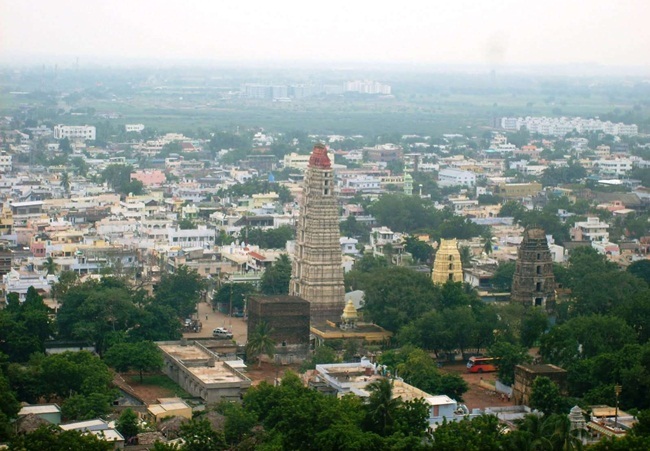 An idol of Lord Vishnu in Narasimha avatar (sphinx) is worshipped at this temple on the top of Mangalagiri Hils. As per the age-old tradition of this temple, jaggery water is poured into the mouth of the idol. It is believed that when the deity feels full, half of the jaggery water comes back out of the mouth and it is distributed as holy prasad to devotees. India is an endless saga of incredible stories, offbeat tourist places and interesting things. Travel on cheap flights to India and explore the country’s kaleidoscopic diversity. Subscribe to Travel Beats for more such stories and get discount airfare deals for India.